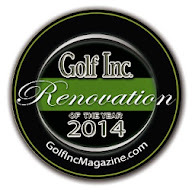 We just had another fantastic week on the renovation project. Not only did we backfill several traps with bunker sand, but we finished up sodding all the bunker floors. That was cause for celebration. We had a pizza party on Thursday to commemorate the accomplishment. I cannot say enough about my staff. They are simply amazing and so are these numbers: since Nov 1, 2012, the staff installed over 320 pallets of sod. That is more than 160,000 square feet or enough sod to cover more than 2.5 football fields. Keep in mind that is only the sod we have purchased and brought in on pallets. They have also laid countless feet of sod that they harvested off of fairways so as to save all that precious, beautiful poa turf. All that work is really paying off as we start to see the bunkers backfilled and completed. For example look at the one in the picture above. This monstrous bunker is so cool as it comes into play on both 7 and 16. It's neat also because it is very open around it and you get views of it from many points on the course. Truly a masterpiece. On the other side of the 7th fairway is this guy which we moved out into the line of play quite a bit. It really has some personality all its own. Here's the look of 5 from the landing area, probably the most impressive overall bunker complex on the property, but then again it is hard to judge since there is so many great bunkers out there. Of course I have to acknowledge the spray team. Tim and Jason were gett'n it done and at one point I think they had 6 bunkers done ahead of the back fill team. I think it's safe to say that for the rest of their lives, they will never kill as much grass as they did this week. The final raking of the new sand is hard work. The more people working on it ...............the better. I don't want to suggest that the back fill team wasn't able to keep up with everyone else. These guys were putting in some serious miles this week with the dump trucks as they were pulling double duty filling bunkers and hauling over 600 tons of rootzone sand to the new tees. As great of a week this was with the bunkers, it was probably even better with the rapid construction of the tees. Check out this picture of the tee on 11. Seeing a dumptruck in the middle of it really helps to appreciate the massive scale of this teeing ground. This tee is over 210 feet long. Here's how it looked after the final grade was put on top. There is still a little work to do on the surrounding area. The new tee on 13 is totally sod ready. Yes, all the sand you see here is area that will now be fairway type turf so the ball will come off this slope and back onto the green. The new tee on 9 makes it the longest hole on the course at just over 570 yards. Again, this tee shot is very tight. The master plan calls for some tree removal on the left side which will make this tee usable, and that part of the project is still not completed. One of my favorite new teeing grounds is this one on 16. Again the height of cut will be tight fairway type turf here that connects the surface of the tee to the surrounds of the adjacent green. This tee added over 15 yards to this wonderful par 5. So anyway, you can see that we had a great week. To date all the bunkers are completed except those that we sodded since February. There is 23 of them yet to backfill and that will happen the first week of May. In the meantime, we will be working on grassing the tees and sodding several other areas that were impacted by the project. There is a lot of excitement around the Club as it's obvious we are getting close to calling this project finished. Lastly, here is some pics of a few of the new bunkers that I have not shown you yet. This is the green on #3. A very nice pair of bunkers. The fairway bunker on 2 was expanded to squeeze the landing area on this short par 4. Here's the green on 2. The bunker left is big and deep. The bunker right is no more. You can tell Boo likes it.